The day was April 25, 1976. The place was the Dodger Stadium, Los Angeles. The time was the 4th inning. 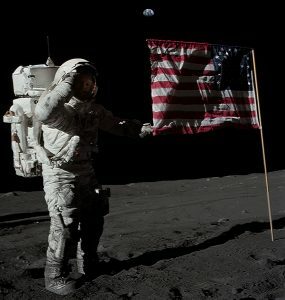 And the man who saved the flag was Cubs center-fielder Rick Monday…. Robert James “Rick” Monday, Jr., age 67, is a former center fielder in Major League Baseball and is currently a broadcast announcer. From 1966 through 1984, Monday played for the Kansas City/Oakland Athletics (1966–71), Chicago Cubs (1972–76) and Los Angeles Dodgers (1977–84). In a 19-season career, Monday compiled a .264 batting average with 241 home runs and 775 RBI. He was selected an All-Star in 1968 and 1978. Monday served in the Marine Corps Reserve as part of his ROTC obligation after leaving Arizona State. On April 25, 1976, during a game at Dodger Stadium, two protesters, William Thomas and his 11-year-old son, ran into the outfield and tried to set fire to an American flag. Monday dashed over and grabbed the flag to thunderous cheers. He handed the flag to Los Angeles pitcher Doug Rau, and the ballpark police officers arrested the two intruders. On August 25, 2008, Monday was presented with an American flag flown over Valley Forge National Historical Park in honor of his 1976 rescue. Monday still has the flag he rescued from the protestors; he has been offered up to $1 million to sell it, but has declined all offers. I wonder if this were to happen today, would there be a quick-thinking patriot like Rick Monday to save the flag? They may be little in stature, but they have big voices and even bigger hearts. Ranging in age from 8 to 13, the girls are the Cactus Cuties, named for the Cactus Theater in Lubbock, Texas. And yes, Moochelle, they do “all this for a damn flag“! Cami Caldwell is the Cactus Cuties’ coach, and this is their website. Darla Dawald of Patriot Action Network reports, March 30, 2012, that a teacher at Arizona’s Maricopa High School mocked a female student for standing up for the Pledge of Allegiance. So if your kids go to school at Maricopa High do they stand for the Pledge? I think you might be surprised. My daughter is the only one in her class to stand and the teacher joined in with the class to mock her about it. I am so angry right now!!!! I am so upset about it. The teacher then asked her to stay after class to talk about it and it embarrassed her even more. She wrote her feelings, her precious heart could not say what she felt, and she hated the feeling of the class and now he wants to try to take her to the counselor to ‘talk’ about it. I am very proud of my daughters. They have had many experiences to be one of the few or the only one to stand in many situations for honorable values and standards. Please join me in calling Maricopa High School at (520)568-5100 to let them know what you think. Remember to be courteous and polite but firm. The Teachers name is Mr. Almond. I cannot find a Mr. Almond among the school’s staff, but there is a male teacher named Charles Allman, (520) 568-8100 ext. 4087, e-mail: callman@musd20.org. (Maricopa, Ariz.) – Following is statement from June Celaya, principal of Maricopa High School, regarding a student who recently observed the pledge of allegiance. “On Wednesday, March 28, 2012, a student stood to take part in observing the pledge of allegiance, while others in the classroom chose to remain seated – a right, and a choice, given to every student per our MUSD School Board Policy regarding ceremonies and observances. Those who choose not to participate are expected to observe the courtesy of not disturbing others. Unfortunately the student who stood to observe this patriotic right, returned to her seat prior to finishing the pledge and indicated that she felt mocked and embarrassed by other students in the room via written communication to the teacher, Mr. Charles Allman. Mr. Allman then asked to speak to the student privately to clarify her concerns. Upon determining her feelings, Mr. Allman followed protocol and reported the incident to the counselor, with whom the student was given the option to speak. It was Mr. Allman’s first priority to ensure the student felt safe in her learning environment, which is truly a second home for all students. For more information on the Maricopa Unified School District visit www.maricopausd.org or call (520) 568-5100. You can also read MHS’s Pledge of Allegiance Statement in PDF format, here. If Mr. Allman is such “an exceptional teacher,” why did he not stand for the Pledge of Allegiance? Not only is that the proper etiquette, when he saw that out of an entire class of students, only one student (Greg’s daughter) stood up, as the teacher he should have stood up himself, as well as urge the other students also to stand — if only to spare the girl embarrassment. I was a teacher — a university professor — for 25+ years. I would have done that, for the sake of the girl, even if I didn’t believe in standing at attention for the Pledge. By allowing a situation in his classroom where a lone student stood alone for the Pledge, this “exceptional teacher” not only was insensitive to the feelings of one of his students, he also set a very poor example to the other students by violating the U.S. Code. When the flag is completely folded, thirteenth fold, the stars are uppermost reminding us of our national motto, “In God We Trust”. The next time you see a flag ceremony honoring someone who has served our country, either in the Armed Forces or in our civilian services such as the Police force or Fire Department, keep in mind all the important reasons behind each and every movement. For the flag ceremony is America’s tribute to those who have paid the ultimate sacrifice for all of us. H/t beloved Wendy, a vet. On the night of November 14, 2011, the Green Bay Packers played against the Minnesota Vikings in Lambeau Field, Wisconsin. The ESPN cameras were there to record the football game.